The South Devon Railway (SDR) achieved another new milestone today (Wednesday 11 June 2014) in carrying the line’s two millionth passenger. New SDR Railway Manager Chris Williams presented the lucky travellers with a free family round-trip and Three Great Attractions ticket at the Buckfastleigh booking office, along with an SDR guidebook and limited edition signed print, plus £20 of vouchers, in his first public rôle since he started full-time on 2 June. 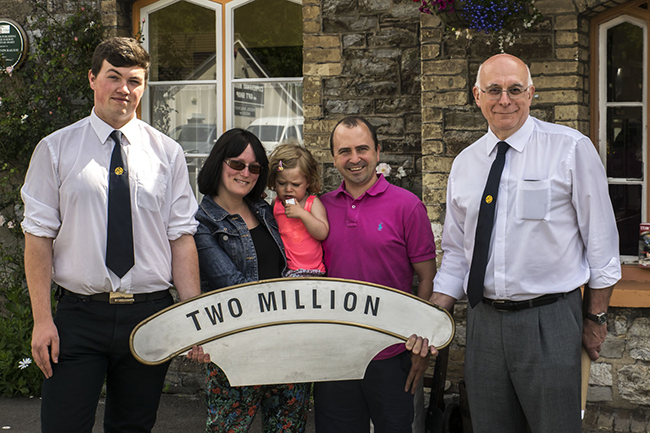 The two millionth passenger was Lucy Bain, along with her husband Richard and daughter Lacey from Kent who travelled on the 10.45 departure from Buckfastleigh. They are staying in a local holiday park and learned about the SDR via the web and were drawn by the railway’s ‘Three Great Attractions – One Amazing Day’ joint tickets. In 1991, the first train of the South Devon Railway’s new era left Buckfastleigh for a round trip to Totnes, as then without a footbridge giving access to the town. Now, the scenic railway regularly carries over 110,000 passengers each year over seven miles of line and is a much loved West Country tourist attraction. It carried the first millionth passenger in 2003. Nearly all of those passengers use the train to visit the communities along the route and spend money locally which supports the local economy. That first four-coach train was hauled by an industrial steam engine. Today, trains of five or six coaches run behind a fleet of former mainline steam locomotives once owned by the GWR.